Hello, everyone, I'm starting a new show on TM radio, it's called EGOISM and it will be broadcasted twice a month.There won't be guests, I'll be on my own:) I'll play different styles like progressive, minimal, house and tech-house. Get ready and stay tuned. Soon more info. 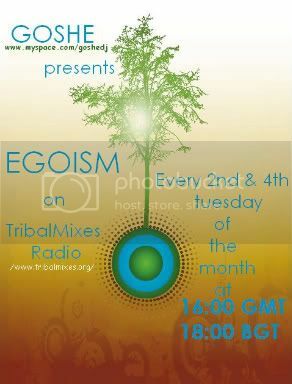 EGOISM will be broadcasted twice a mont every 2nd and 4th tuesday at 04:00 PM.